Lead by the Academy of Model Aeronautics and Association for Unmanned Vehicle Systems International, manned and unmanned aviation communities come together to advocate for regulatory framework. With a rise in turnover of around 2% to €2.28 billion in the business year 2013 (2012: €2.24 billion), the Festo Group continued on its course of growth in a difficult environment of volatile global markets. Festo has thus grown more than 8 % per year over the past four years (2010 to 2013). Kratos Defense & Security Solutions, Inc., a leading National Security Solutions provider, announced today that its Micro Systems, Inc. subsidiary, of its Advanced Drones and Target Systems Division, recently received a contract from the U.S. Army valued at $4 million to produce unmanned aerial drone command and control systems. A digging robot inspired by the unique mechanisms employed by the Atlantic razor clam has been created by a group of researchers in the US. 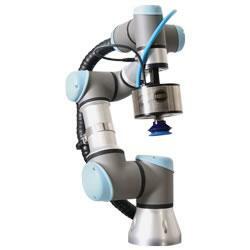 04/09/14, 02:52 PM | Industrial Robotics | SCHUNK Inc. The new RST-D has been strengthened in areas that help increase performance and improve lifecycle.